I was recently reminded what our kids take away from their sports, and what we do as parents, are two totally different things. My 11-year old played her first volleyball game with her 6th grade school team. They lost in two games in a row. There were maybe three tangible rallies in the game and 90% of the serves didn’t make it over the net. The parents sat wringing their hands and drooping our heads. “Painful” was the adjective used to describe watching our group of girls learning the game of volleyball. Yet my daughter popped into the car when it was done and turned to me and joyfully said, “I think I kind of like volleyball! That was fun.” Unfazed by the loss, she cartwheeled on the court after the game and sang in the car with me on the way home. 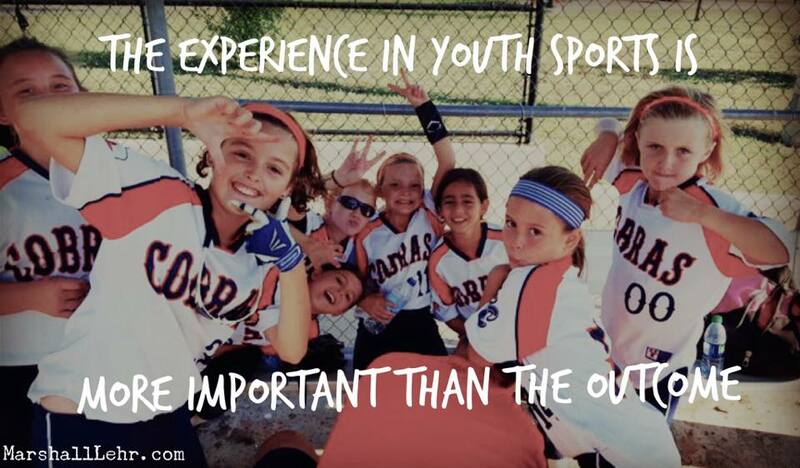 It was a great reminder that the experience, especially in youth sports, is so much more important than the outcome. After suffering our eighth loss in a row this past weekend and moving our fall record to 0-8, our team of 9 and 10-year-old fastpitch players raced to line up at third base at the end of the game with huge smiles on their face. At times throughout the day, the head coach and I used words such as “painful” and “disastrous” to describe our performance. However, the pictures from this weekend’s games, including this one taken from the dugout just before our fourth loss of the day, demonstrate that they were enjoying the experience despite the less than optimal performance. They have huge smiles from ear to ear and just love competing. When the final huddle broke and the girls headed toward the parking lot their demeanor hardly suggested an 0-4 finish. My hope is that we as parents and coaches don’t steal that joy away too soon. My hope is that we can delay as long as possible before informing them that they are not supposed to be happy following a loss because the outcome is more important than the experience. Check out Teaching Love – The Critical First Phase to read more about why I think it’s crucial for us to let them enjoy the experience especially that this age. I can already hear the skeptics so let me clarify a bit before moving on. That’s not to say we settle for the less than optimal results. We don’t just skip off into the sunset simply accepting that the challenge exceeded our skill. Instead we will go back to practice and work our tails off to get better. Then we seek out greater challenges. In order to maximize our potential we should continually seek out challenges just beyond our current skill level. In continually reaching just beyond our current level of ability we will get better faster. Here’s the kicker though, if we are frequently playing at the edge of our ability there will be losses and failure along the way and that’s okay. That’s the price of rapid improvement. Around the time children enter kindergarten they begin to notice that their mistakes inspire certain reactions in grown-ups. What do we do? We frown, our cheeks flush a bit, we rush over to our little ones point out that they had done something wrong. What’s the lesson we are teaching? Embarrassment, fear, shame. Let me close by, simply saying this. It’s not that we are settling for good enough and resigning to defeat. Instead, it recognizes that rapid improvement is the product of effortful hours at the limits of one’s capabilities. Failure is part of the process.